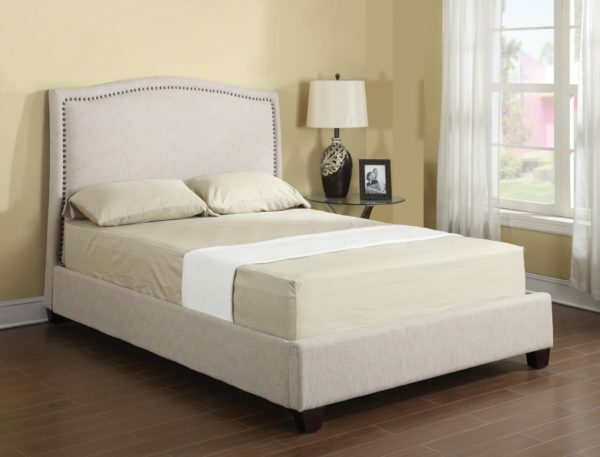 The Lilian Platform Bed has an elegant silhouette that is covered in a soft chenille-like vanilla fabric. Design details include a sophisticated herringbone pattern and stylish nail head accent finish. The Lilian Platform Bed kit includes a screw-in slat roll, bolt-on rails for added stability (not hooks), center support on slats and wood feet. The Lilian headboard is also sold separately. Available in Queen 5/0, Eastern King 6/6 and Cal King 6/0 sizes only.